Google Maps or how to find a satellite image of the place I live!!! Would you like to learn how to find in the internet a satellite image of a place you live? Or a map of your neighbourhood? Plan your excursion on the weekend or see how to get to the holiday destination? The interactive portal Google Maps is just for that!!! Have yourself a look at new, updated satellite images !!! Click to see a satellite image and a map of the Wawel Hill with Cathedral and Royal Castle in Cracow, Poland. This instruction has been kindly provided by G. Myrda -Geostrada.com . Translated by Malgorzata Czart . Google Maps, or how to find in the internet a satellite image of the place I live ! What is it "Google Maps" ? 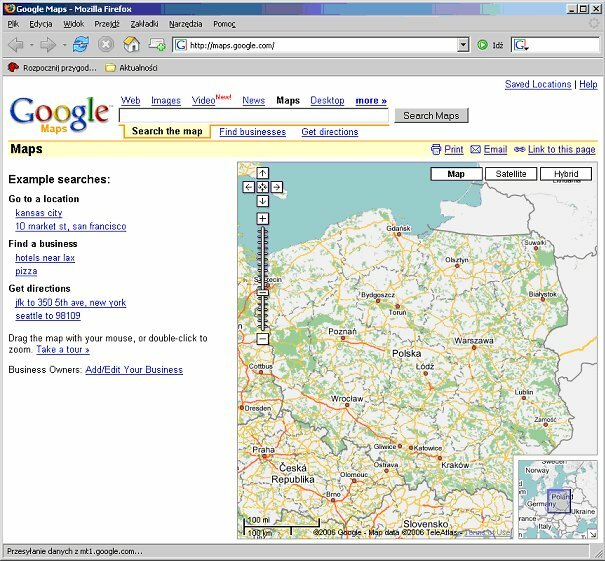 Google Maps is an Internet service that allows to use the maps of the globe that are hosted by the Google company. The main component of the map are satellite photos. It is possible to put vector data on satellite photos. Even though they are not so spectacular, they are much more functional, since they, for example, make it possible to determine a route. The type of data we want to see can be toggled by use of buttons that are accessible in the right top corner of a map. We can choose the following: satellite photos only, vector data only or a hybrid map, which means that satellite photos will be placed under the vector data. 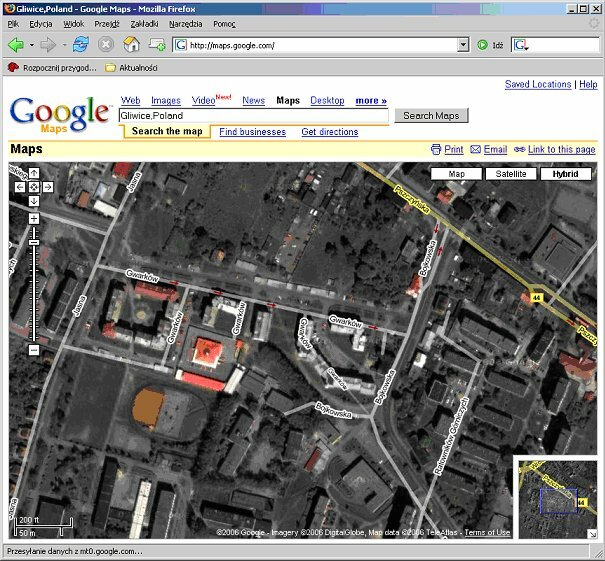 In comparison to Google Earth or NASA Word Wind, Google Maps allows to access the maps only with the use of a browser. The main advantage is that you don't need to download or install any files. 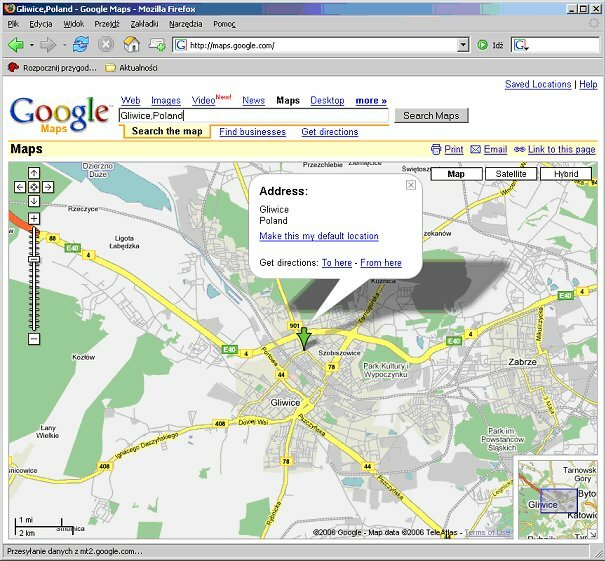 However, the whole functionality must work in the environment of a browser, which makes that Google Maps doesn't offer the functionality that would be as advanced as in the case of Google Earth - for example we don't have an effect of three-dimensionality here. Nonetheless, most of functions that are available in Google Earth, can also be used in Google Maps, only their realization sometimes differs. How to find my region ? Enter the name of your location in the field "Search the map". Remember to add comma and the name of your country. For example: "Gliwice, Poland". If the place is found, it will be shown on the map. Fig. The result of your search. It is also possible to find a location on the map by providing its geographic coordinates. For example, if you enter the following data: 50.061643,19.93922 (or +50° 3' 41.91", +19° 56' 21.19") the Mariacki Church in Cracow will be found. The content of maps in Google Maps can be enriched with additional information. Conventionally, the maps are provided by Google with information on points of interest such as restaurants, hotels, petrol stations. 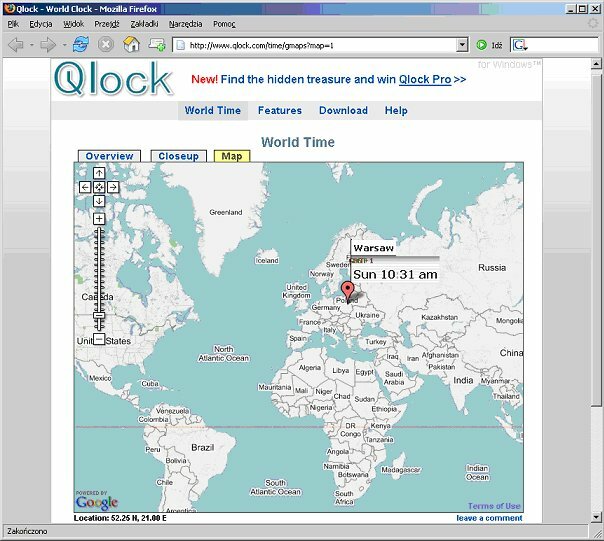 Such maps with additional user data can be embedded in their private WWW pages.